Germany’s Left Party (Die Linke) calls for EU-wide referenda, criticises austerity policy and denounces bailouts for banks, sparking claims of significant overlap with the right-wing Alternative for Germany (AfD). The Left Party rejects these allegations. EURACTIV Germany reports. “We are not pursuing an anti-European election campaign,” campaign manager for Germany’s Left Party, Matthias Höhn, told euractiv.de. The party’s days of turmoil over the European question appear to be numbered. Just a few months ago, the Left Party held a discussion over the basic principles of Europe in response to internal debate over its own European policy agenda. Even statements from party-magnifico Oskar Lafontaine, who previously called the euro “catastrophic” and advocated dissolving the eurozone, have faded. “We say ‘yes’ to the European project but we criticise the processes and decisions within the EU. On the issue of social justice, we criticise the EU quite clearly”, said Höhn. 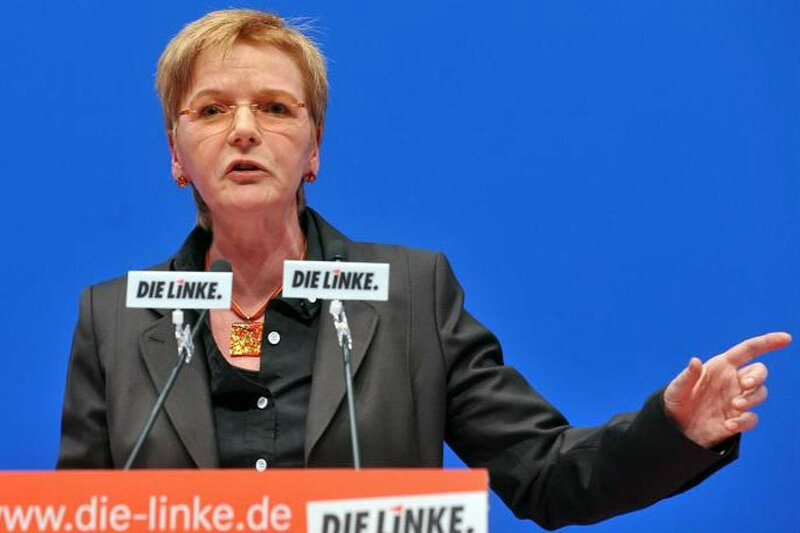 “We support the EU”, emphasised Gabi Zimmer, the German Left Party’s top candidate. “But we need a social foundation to support it. In its current form, the EU is a faulty design”, she said. Within the Left Party, the EU is indeed viewed critically, and until a few months ago “this criticism shifted to rejection for some party members”, Zimmer recalled. But what the Left Party is actually campaigning for is a “change of relations” – more democracy and less militarism, she explained. The discussion is important, Zimmer said, and must continue to take place. Meanwhile the AfD says: “A democratically illegitimate ‘Troika’ – comprised of representatives from the EU, the European Central Bank (ECB) and the International Monetary Fund (IMF) – is forcing popularly elected parliaments to take on budget cuts and structural reforms”. In an interview with EURACTIV Germany, AfD candidate Beatrix von Storch called the austerity measures an “undemocratic, brutal austerity policy”, which “harms the people in Greece”. But the AfD and the Left Party also agree on other points. Both call for EU-wide referenda, strict regulation of banks, and more understanding for Russia’s conduct in the Ukraine crisis. Still, the Left Party labels the AfD as its “political opponent”. This is because the AfD is fundamentally pursuing other goals, said Höhn. Zimmer called the AfD’s economic policy irresponsible. “The AfD is threatening the operability of society because it is pushing radical market solutions, massive tax cuts for the rich and social exclusion. Whoever focuses first and foremost on national interests, is destroying the EU,” said Zimmer. Apparently the heterogenic Left Party has found a common language, which was also important for the party’s European election campaign, emphasised party researcher Robert Lorenz from the Institut für Demokratieforschung in Göttingen, Germany. At the moment ,the Left Party is simply happy that peace has set in within its own ranks, he said. Sahra Wagenknecht, deputy faction leader for Die Linke in the German Bundestag, has toned down her criticism of Europe, the party analyst pointed out. Meanwhile, the party’s top candidate duo Katja Kipping and Bernd Riexinger are capable of unifying the Left Party, Lorenz said. And hardly anything can still be heard from prominent Eurosceptic Oskar Lafontaine. His followers are currently in a minority, the political scientist indicated. May’s European elections are the first to be held under the Lisbon Treaty, which grants the European Parliament the power elect the president of the EU Commission in a vote. According to Article 17.7 of the TEU, heads of state in the European Council have to “take into account” the results of the EU elections, and nominate their candidate “after appropriate consultations" with the newly elected parliament. But president of the European Council, Herman Van Rompuy, has shown strong objections to the idea and keeps the option on the table that EU leaders will nominate an outsider who didn’t step up as candidate – much against the will of pan-European parties. Find up to date information on the 2014 EU elections here.